Why is commenting important for your blog? "I just found out that you are an active commenter on most blogs. Your comments are easily 100 comments in one week. Would you please tell me what is the benefit of commenting, such as traffic or relationships or SEO or something else? Or do you just comment for your interest? " Dharmenra has answered himself, by mentioning some of the important points of benefit from commenting in his question, his own question. For the answer in the detail of his question, it would be better to write a detailed post, instead of just answering it, because it is important for all bloggers or social media activists to know the importance of commenting. 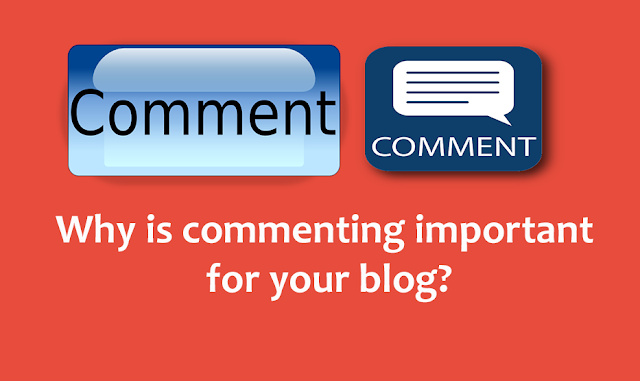 How do you benefit from commenting on blogs? This is the most important reason to constantly comment on other blogs. If you find yourself complaining that your site is not getting enough traffic from search engines, then it may be because your site does not gain authority from different search engines. When you comment on blogs, they help in creating backlinks, which in turn generate traffic for your blog. Many do, but if not, then most of the links are nofollow links and hence they have less value, but this process is still useful. Commenting for new blogs helps in faster indexing of blogs. As mentioned above that they relate to the backlinks, a major positive result of commenting is increased traffic (Increased Traffic). Commenting helps bring traffic to your blog, but it is very important that you just add comments containing value. Generic comments such as "Thanks ... .nice..post!" Will ultimately do nothing for your blog or brand. Always, value is the only way, value is the only way. Furthur has its advantages, if you take advantage of WordPress's threaded comments. For example: Answer the question asked in Post, whether it's your own blog or someone else's If anything is in value, then it is appreciated by all. Make sure you have added an image with your email account. For help with this element, use Gravatar.com. Commenting with your keyword as a name, there are great advantages in terms of SEO, many bloggers see it as spam and do not accept such comments. But if you comment without self promotion, and add more value to the post, then your comments will be gratefully accepted. We have read the importance of SEO for bloggers many times, and furthermore, in this way proper commenting can help a lot in SEO. Quality Commenting offsite SEO issues and this is a great way to get backlinks for your blog. Comment using your keyword as a name. Comment on blogs with Dofollow policies. Comment using the Top Commentator widget. Once again, we can not give much stress, that we should make such comment which means orginal lost in meaning and value add. Commenting is the best way to connect with a blogger personally. Well it takes time to form such connections, once you regularly comment, you will be notified by the site administrator and also by other co-bloggers. Development of these connections can be very helpful in long term. If you are surprised that despite the great content, you can not get enough traffic, commenting, you will see its benefits in real time.